Click the appointment that you want to repeat. Click the Recurrence button in the Ribbon. The Appointment Recurrence dialog box appears. 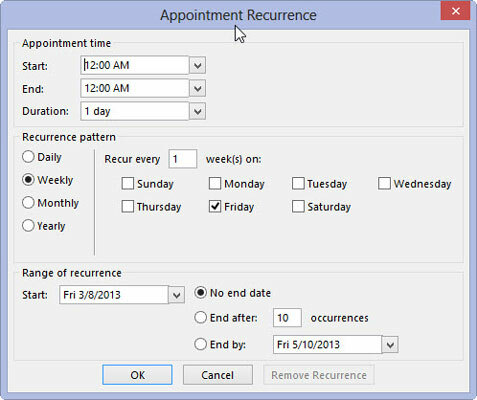 If you simply click the OK button to accept the preset choices in the Appointment Recurrence dialog box, your appointment will repeat at the same time each week forever. However, you might not be prepared to schedule meetings from now until doomsday. Doomsday isn’t a federal holiday, by the way; you’ll still have to work (unless you take a personal doomsday). So you might want to fill in the rest of the Appointment Recurrence dialog box just to be sure. Click the Start text box and enter the starting time. Outlook assumes that your appointment is 30 minutes long unless you tell it otherwise by entering an ending time as well. Click the End box and enter an ending time if you feel the need. 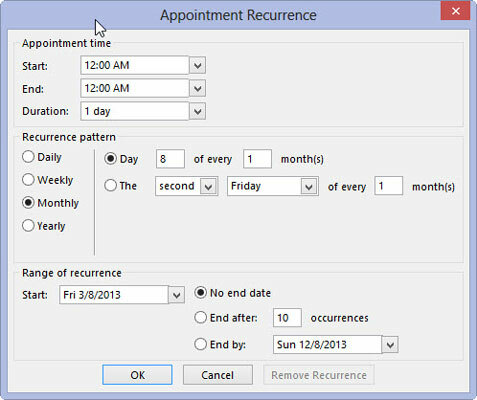 In the Recurrence Pattern section, click the Daily, Weekly, Monthly, or Yearly option button to select how often the appointment recurs. In the next part of the Recurrence Pattern section, choose how many times the appointment occurs. In the Range of Recurrence section, enter the first occurrence in the Start box. 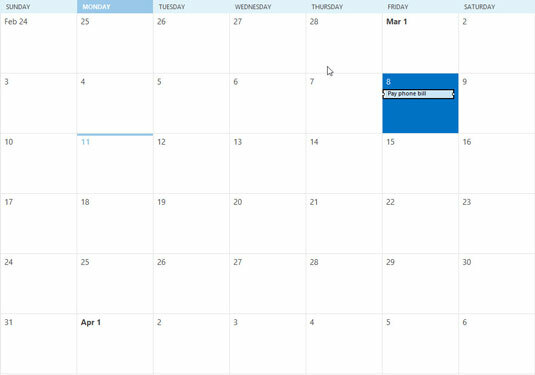 Choose when the appointments will stop: No End Date (infinity), End After (a certain number of occurrences), or End By (a certain date). The Appointment Recurrence dialog box closes.